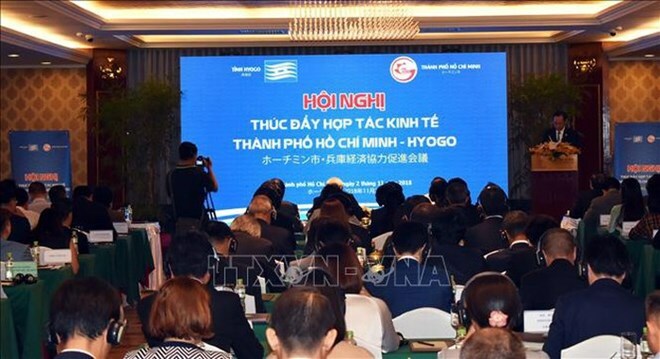 Representatives of the Ho Chi Minh City People’s Committee and Japan’s Hyogo prefecture held a conference in Vietnam’s southern economic hub on November 2 to look for ways to promote the economic cooperation between the two localities. The function, the second of its kind, drew the participation of representatives of nearly 150 enterprises from both countries. Opening the conference, Permanent Vice Chairman of the Ho Chi Minh City People’s Committee Le Thanh Liem stressed that during its development, the city has been calling for cooperation and investment from foreign countries, especially Japan, to the fields the city is in need such as industrial production, high technology, seaport services, high-tech agriculture, and human resources training, among others. Expressing his belief that the cooperation potential between the two localities is still large in various fields, Liem said he hoped that in the time to come, Hyogo firms will intensify their cooperation with those from Ho Chi Minh City. The official affirmed that the municipal authorities will facilitate, go along and support firms from Japan in general and Hyogo in particular for their stable, long-term and effective operation in the city. Besides, Liem said he expects Hyogo authorities will welcome Ho Chi Minh City firms to come and explore the investment and business environment in the Japanese prefecture, thus bringing prosperity to businesses and people of the two localities. For his part, Hyogo Governor Ido Toshizo spoke highly of the potential and competitive advantages of Vietnam in the economic development, especially its political stability and abundant human resources. The governor stressed that through this conference, the prefecture hopes Vietnamese firms will develop their investment and business in Hyogo, along with the continuation of labour cooperation programmes. At the conference, companies of the two localities were briefed on the socio-economic situation, investment attraction policies, and economic development prospects of the two sides. Since 1998, Japan has had 1,240 investment and business projects in Ho Chi Minh City with a combined capital of over 4 billion USD, ranking 5th among about 100 countries and territories investing in Ho Chi Minh City. Hyogo firms have 34 projects in the city, focusing in the fields of science and technology, logistics, trade and services. The prefecture is now home to about 15,000 Vietnamese and about 30 percent of foreign students in Hyogo are Vietnamese./.